Policy ownership of development agenda emerged as an important aspect in international development cooperation during the 1990s in the wake of evident failures of reform initiatives in developing countries steered by donor agencies, particularly the international financial institutions (IFIs), the World Bank (WB) and the International Monetary Fund (IMF). 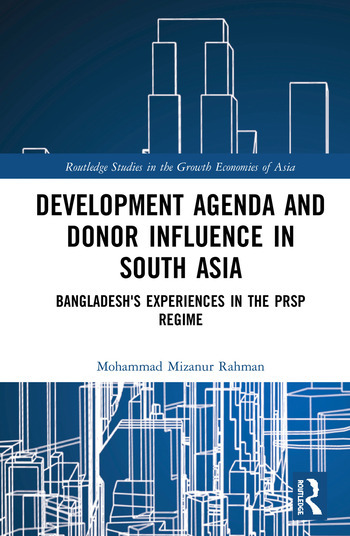 The principal focus of this book is to examine Bangladesh’s policy ownership in its PRSP by broadly analyzing the dynamics in the formulation process and examining the principal actors’ contribution to the formulation process. This book also deals with several other dimensions of foreign aid and its changing features including the shifts in WB-IMF’s approach to development cooperation. This book argues that the WB-IMF strongly influence Bangladesh’s development strategies and agendas and in general the WB-IMF have not changed much in their aid relationship despite clear limitations of their previous reform models. Building on Bangladesh’s current level of development the book advocates that Bangladesh needs to adopt a new model for development agenda setting. Illustrating the influences of donor communities on the creation of development strategies in developing countries, this book presents a macro dynamics of the political economy of international development cooperation. It will be of interest to academics and professionals working on political economy, governance, public policy and development cooperation as well as South Asian Studies. Mohammad Mizanur Rahman graduated from the University of Dhaka in the Political Science department and afterward received his PhD from the Institute of Bangladesh Studies (IBS), University of Rajshahi, Bangladesh. He is a career civil servant in Bangladesh with almost 20 years professional experience to his credit and has worked in different Ministries of the government including field administration. He also worked as a Policy Specialist for over four years in the Aid Effectiveness Project of the UNDP, Bangladesh. He published several research articles in national and international journals and also contributed several book chapters.